Russia exported more than 5.2 million barrels per day (b/d) of crude oil and condensate and more than 2.4 million b/d of petroleum products in 2016, mostly to countries in Europe. Exports of crude oil and petroleum products represented nearly 70% of total Russian petroleum liquids production in 2016. Russia’s oil and natural gas industry is a key component of Russia’s economy, with revenues from oil and natural gas activities—including exports—making up 36% of Russia’s federal budget revenues. Crude oil trade is important to both Russia and Europe: about 70% of Russia’s crude oil exports in 2016 went to European countries, particularly the Netherlands, Germany, Poland, and Belarus. Similarly, Russian imports provided more than one-third of the total crude oil imported to European members of the Organization for Economic Cooperation and Development. 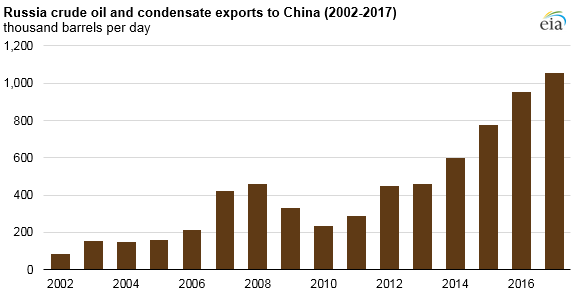 Outside of Europe, China was the largest recipient of Russia’s 2016 crude oil exports, receiving 953,000 b/d, or about 18%, of Russia’s total crude oil exports. Russia was the largest supplier of crude oil to China in 2016, surpassing Saudi Arabia for the first time on an annual basis. Note: 2017 data are January through September. In 2016, more than 80% of Russia’s crude oil and condensate exports were seaborne. However, regardless of the ultimate mode of transport, most of Russia’s crude oil exports must traverse Transneft’s pipeline system, either as a direct route to reach bordering countries or to reach Russian ports. Russia’s state-owned Transneft holds a near-monopoly over Russia’s pipeline network, although some smaller volumes of exports are shipped by rail and on vessels that load at independently owned terminals. For more information on Russia’s energy industry, see EIA’s recently updated Russia Country Analysis Brief.